Wild Turkey, Male and Female. Meleagris Gallopavo. Charles Bonaparte [1803-1857], mentioned earlier in connection with his four-volume supplement to Wilson's American ornithology, was also caught up in studies of nomenclature and in trying to organize a catalog of all known bird species and genera. Beginning in 1850 and ceasing uncompleted on the author's death in 1857, Bonaparte's two-volume Conspectus generum avium represented a major accomplishment toward arranging and comparing some seven thousand recorded species of birds. 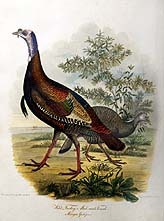 The Hill Collection contains several additional works by Bonaparte: Observations on the nomenclature of Wilson's Ornithology (1826); The genera of North American birds (1828); and A geographical and comparative list of the birds of Europe and North America (1838). Bonaparte's handsome Monographie des Loxiens was published in 1850. This study of the crossbills, grosbeaks, and allied species was illustrated with fifty-four excellent hand-colored lithographs by Hermann Schlegel. An interesting volume in the Hill Collection is the beautifully illustrated Esquisses ornithologiques, by Bernard Du Bus de Gisignies [1808-1874]. Issued in five parts from 1845 to 1850, this work depicted new species discovered in New Zealand, South and Central America, and West Africa in the mid-19th century. A well-illustrated report of early-19th century French exploration in the New World is the Voyage dans I'Amérique méridionale by Alcide Dessalines d'Orbigny [1802-1857]. Volume four, Oiseaux (1835), is part of the Hill Collection. Another French ornithologist of the 19th century, Alf. Malherbe [d. 1866] produced a major study of the woodpecker family. The four-volume Monographie des picidées (1861-1862) describes every known species of woodpecker, with hand-colored lithographs to accompany the detailed review.